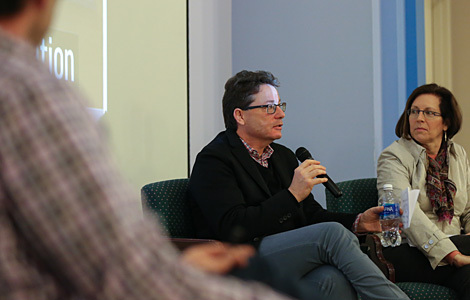 BDA Principal and Professor of Graphic Design Communication Frank Baseman was invited to participate on a panel discussion on Design Thinking and Entrepreneurship during Penn State Startup Week at (his alma mater) Penn State University, University Park campus. The panel was moderated by Kelleann Foster, Director of the Stuckeman School of Architecture and Landscape Architecture at Penn State. Frank was joined on the panel by Maggie Hanson, Visiting Assistant Professor, Landscape Architecture, Penn State University; and Dan Rowland, Creative Director of Rowland Creative, State College, PA.